Cheating, fraud and plagiarism are bad, right? Well, what if an art forger makes an ogre and a despicable group of people look like buffoons? Do the ends justify the means? 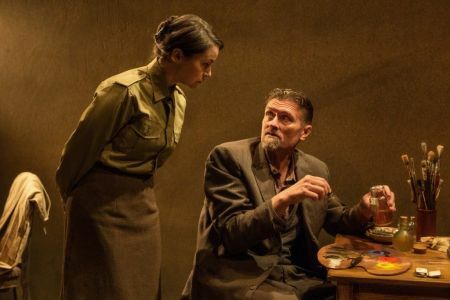 That’s just one of the tantalizing questions at the core of The Bakelite Masterpiece, now on stage at Toronto’s Tarragon Theatre’s Extraspace. Based on the true story of Dutch art forger Han van Meegeren, The Bakelite Masterpiece explores the nuances and subtle distinctions between right and wrong. Fifty Shades of Grey? That’s nothing. This play explores 50 shades of the human condition! Han van Meegeren forged a lost painting by Vermeer and sold it to none other than Herman Goering, Hitler’s second in command at the end of World War II. The Nazis got ripped off for millions, van Meegeren faced the death penalty as a collaborator and the situation got messier than a kindergarten art room. What’s not to love about this play? Written by Kate Cayley, The Bakelite Masterpiece features Geordie Johnson as Han van Meegeren and Irene Poole as Geert Piller. Both actors are convincing throughout the performance and often riveting. The play takes place entirely in van Meegeren’s holding cell as Piller investigates the case against him. Piller is an art historian intent on putting the accused to death. She knows he is guilty and the only question is whether it should be done by hanging or with a hot lead injection to his skull. While the two are exceptionally antagonistic at first, they eventually warm to one another. Van Meegeren ends up almost seducing Piller. He convinces her to let him prove he did fake the painting. She not only brings him painting supplies, she even poses for him. For me, Piller posing was the perfect moment of The Bakelite Masterpiece. The matte and dark confines of van Meegeren are transformed into something other-worldly after she trades her military-issue khakis for a gorgeous blue dress. The light strikes her perfectly. It’s the sort of image that elevates us, eliminating us all of our daily stresses and making us feel 20 pounds lighter. I couldn’t help but think that this play was anything but feminist. Piller develops a sort of reverse Stockholm syndrome. She is at her best when seen as an object, and her work and her self-worth, is devalued as a result. I didn’t like that the male “cowboy” gave validity to her character. I thought the play made her seem like she was inconsequential, aside from the fact she was seduced by a great forger. Johnson does a decent job portraying van Meegeren. He is a self-proclaimed devil, dependent upon morphine and gin to make it through the day; a substantial downgrade from slurping caviar with high-ranking Nazis. The play makes it clear that van Meegeren’s job was difficult. He had to master things like the angle to hold a brush, choosing which bristles to use and how to commit colours and faces to memory. These were just some of the skills that made him such a remarkable forger. The chemicals and processes he used burnt his arms and hands. In the end, van Meegeren knew Vermeer’s signature better than his own. Now that takes dedication. One of the key things that van Meegeren used to pull off the scam was bakelite. Bakelite itself is interesting. It’s a plastic, a phony, manmade substance that lasts virtually forever. It’s typically used as an insulator to protect us from the harmful effects of electricity. Van Meegeren used bakelite to make his forgeries seem authentic. I’ll leave all that amazing symbolism and imagery to you to figure out. And those are some of many questions that this play leaves its audience to consider. We’re left to consider things like: What is true inspiration? What does it mean to be unique, and is it even possible? There’s so many layers, nuances and subtleties in great works of art that sometimes people gaze into them for hours, overwhelmed. It can be a bit like watching a cat all day. It’s totally mesmerizing to the person doing the gawking, but only mildly interesting to others. That kind of sums up The Bakelite Masterpiece. If you are like me and quite like gawking at paintings and cats go see The Bakelite Masterpiece. It just might stir you up on emotional and intellectual levels.